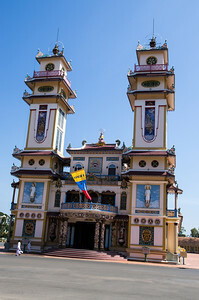 Cao Đài (Caodaism) is a relatively modern syncretistic, monotheistic religion, officially established in the city of Tây Ninh, southern Vietnam in 1926. 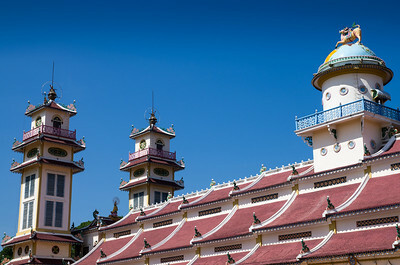 Cao Đài was established in the Vietnamese city of Tây Ninh in 1926. 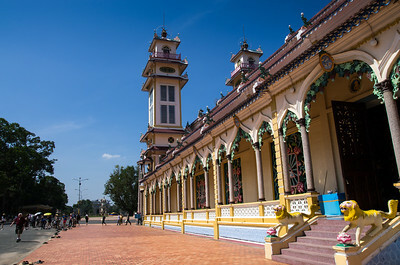 During the First and Second Indochina Wars, members of Cao Đài (along with several other Vietnamese sects) were active in political and military struggles, both against French colonial forces and Prime Minister Ngô Đình Diệm of South Vietnam. 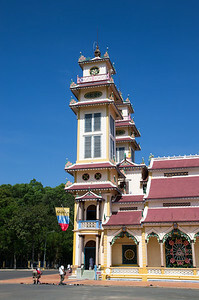 Their opposition to the communist forces until 1975 was a factor in their repression after the fall of Saigon in 1975, when the incoming communist government proscribed the practice of Cao Đài. 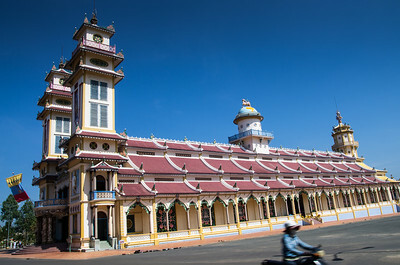 In 1997, the Cao Đài was granted legal recognition. 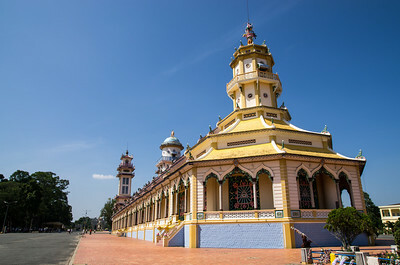 Temple was constructed between 1933 and 1955, the Great Temple of Cao Dai closely resembles a Christian cathedral in its architecture - two square towers, a long central nave with upper gallery, and side aisles. The altar, an apse and ambulatory are at the opposite end from the entrance, just as in a typical church. 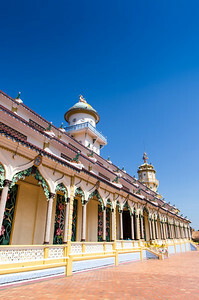 The exterior and interior of the Cao Dai Temple are both extravagantly decorated, incorporating symbols, abstract designs and images of saints. The high ceiling is painted sky-blue with fluffy clouds and the floor tiles have busy patterns. 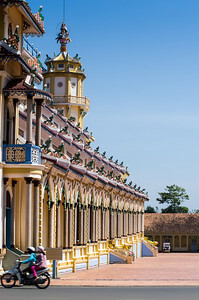 Thedragon-encrusted columns that run the length of the nave number 28, representing the 28 manifestations of the Buddha. 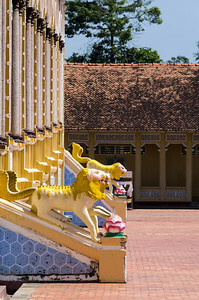 Seven-headed cobras represent the seven human emotions. The most important symbol is theDivine Eye, representing God, which also appears in followers' homes. 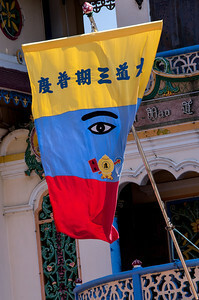 It is aleft eye, because God is Yang, and Yang is the left side. It has a ying-yang symbol inthe pupil. Open time:from dawn to dus. 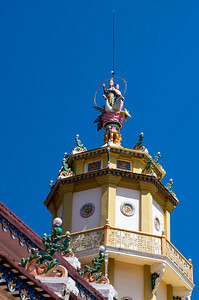 There are four ceremonies with chanting each day:6:00, 12:00, 18:00 pm and midnight. An orchestra of 10 musicians and a choir of 20 youths lead the service in prayer and hymns. 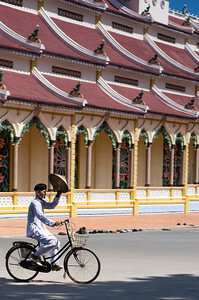 The hymns sound western, but the accompanying music is traditional Vietnamese.